How to Read Tyre Size of Motorcycles and Cars? Reading the tyre specifications and understanding it, is not an easy task when you look at the number on the tyre for the first time. It might be confusing for you to chose the right type of tyre for your motorcycle or your car. This article will make it easy for you to understand it better and make a right choice according to your requirements. If you haven’t observed yet, try observing the numbers and letters written on the side walls of the tyre the next time you look at it. There will be numbers, letters and the tyre branding engraved on the side walls of the tyre and these numbers say it all about the tyre type and dimensions of the rubber you are looking at. 255– Here signifies the section width of the tyre which is to be 255mm. 55– Is the aspect ratio of the tyre. 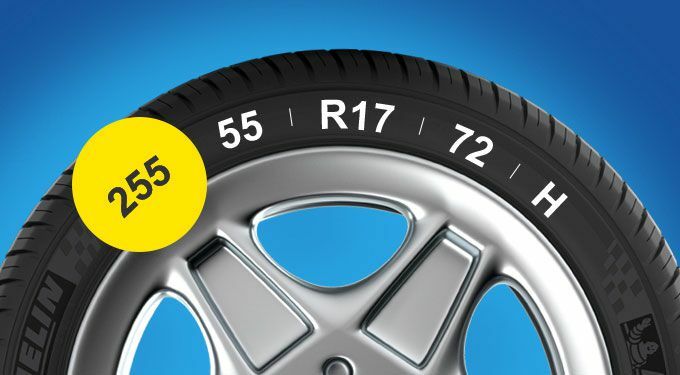 55 means that the section height of the tyre is 55% the section width of that particular tyre. R– Indicates that the tyre is a Radial ply construction. 17– Indicates the diameter of the tyre which is said to 17 inches for the above shown tyre. 72– This indicates the load rating for the tyre which means this tyre can handle a maximum load of up-to 355 kgs. H– H signifies the speed rating of this tyre. H rating tyre can run up-to a maximum speed of 210 km/hr. Understanding these numbers and letters can be confusing at first but once you know about it, it will make it easy for yoy to choose the right type of tyre for your car or motorcycle. If you found this post useful, you can tell us at reach@gaadikey.com and for similar posts, you can also follow us on Facebook, YouTube and Twitter.